Inspired by Granddaughter's drawing » What's Under the Needle? With school break upon us, it is only natural that I spend more time with my granddaughters. Both my girls love to draw like many children their age. 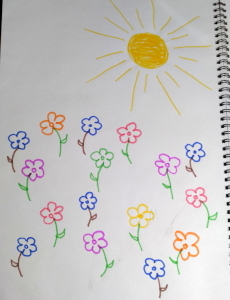 Being only 2 years old, Isabella generally likes me to draw for her and one of her favorite things for me to draw is flowers. We draw big ones, little ones, some to the right, some to the left, and various colored ones. After drawing so many of these flowers I thought, I could quilt these... what fun! 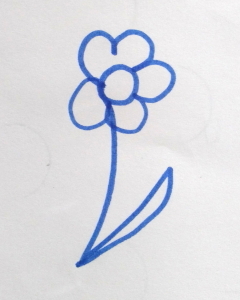 I did a little drawing practice for making a continuous flower without lifting the pen. As I did with the drawing, I started with the center circle and then added 5 petals around it. The stem and leaf were added last. 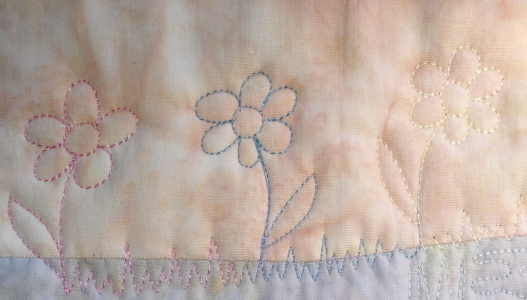 Being a quilting design I knew I'd probably want to connect the flowers so created grass between them. Of course, that meant when I came to stitch the next flower I needed to do the stem first, but I left the leaf until I worked my way back down. 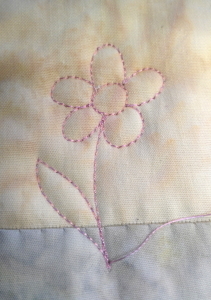 I think it worked out pretty cool how each flower turned out a different color by using a variegated thread. It just happened the colors in the thread were the right amount that it changed as I zigzagged across the grass. I'd have to play with this idea when using a different variegated thread to see if it still worked out the same. 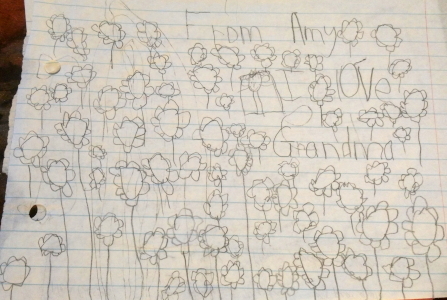 Amy is my 6-year-old granddaughter so she draws her own flowers. Here is one picture she drew for me - I love her words too and the little self-portrait in the box near the center of her drawing. You can see her flowers are quite different with more petals and a bare stem - let's see how they turn out when I quilt them. I quilted in the ditch to connect each stem as I didn't want the connection to be visible. I totally love how these turned out. Very cool indeed! In fact, on showing my daughter who is 36 weeks pregnant, she said "I'll have a whole cot quilt of those please! ".